Servocontrols bagged the prestigious MTS Sales Award for the year 2009 at Germany. The event was organized by MTS Germany on 10th and 11th of June 2010 in Germany. Delegates from more than 20 countries around the World visited the event. 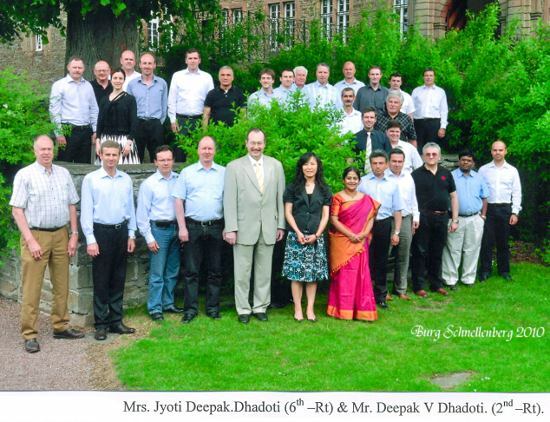 Mr. Deepak and Jyoti Dhadoti represented from Servocontrols India. Mr. Vittorio Franchini, Sales Director MTS Sensor Technologies GmbH & Co. KG handed over the trophy along with a voucher to travel with family anywhere in world to Mr. Deepak Dhadoti. Servocontrols, a Belgaum based company is in the inimitable position to offer the position sensors these position sensors are successfully used by various hydraulic companies across the world. They also manufacture hydraulic actuators with inbuilt position sensors used in civil aircrafts. They also supply level sensors for petrochemical, pharmaceuticals, biomedical, specialty chemical along with respective controllers & software Simulators for aircraft flying. About MTS Sensors(a Division of MTS Systems): delivers leading-edge position and liquid-level sensors, and is the world’s leading supplier of magnetostrictive-based sensor products. The Sensor’s Division was created by MTS Systems when it acquired Temposonics, Inc. in 1984. Temposonics remains the key technology brand for MTS Sensors and reflects an ongoing commitment to high-precision position and liquid level measurement technology development. Congratulations to Dynamic team of SERVCONTROLS. There is no one who can Compitate with cutting Edge Technologists. Best wishes for further achievements. Congratulations sir and also I congratulate each and everyone who has been part of this achievement. Keep going…………. and next time we should be the highest and most prestigious award winner in the history of Indian Industry………..